Among all foods that provide energy for human body, milk may be the most nutrition-rich type because milk provides many essential nutrients for good health. Milk is a food and beverage product derived from animals. The raw milk is pasteurized to effectively kill harmful microorganisms and processed to provide consumers with a variety of food products. Entrust comes from the form of condensed powder with same potency that has almost all the nutrients that a human body needs for a good health. 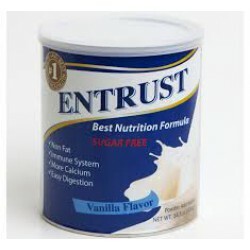 Entrust is a food product, it provides human with a number of dairy products. Depending on the source of milk, the proportion of vitamins and minerals and the fat globules vary. Human milk comprises a higher fat, lactose and calorie level in every 100 gm of milk in comparison to the commonly consumed cow milk. The latter is higher in protein composition. Entrust Nutrition Powder Milk use only materials and ingredients with US origin and US technology with strictest standards. You can readily understand the significance of drinking Entrust every day. It is almost equal to a balanced diet. You should drink at least a glass of Entrust daily. This will not only fulfill your nutritional requirements but also make your body strong and more resistant to diseases. Entrust gives you a healthy life.